Geometric windows are often times thought of as synonymous with specialty windows, although this is not entirely true. Geometric windows are technically a smaller subset of specialty options because they wouldn’t include any window with an arch or a curve such as half circles. There are a number of varieties of geometric windows that can add visual interest and real panache to a home. Geometric windows are essentially a small subset of a specialty window and do not include curved or arched windows. Common windows in this category include Full Circle, Clipped Corner, Double Clipped Corner, Half Circles, Hexagon, Isoceles Triangle, Octagons, Parallelogram, Pentagon, Rectangle, Right Triangle, Square, Triangle, Trapezoid and Truncated Hip. Basically any window that is produced in a geometric shape. By the definition, geometric windows are actually a larger category than specialty windows because they would encompass squares and rectangles, which account for 90% of all window frame shapes produced in America. However, within the industry, the term excludes these two common frame shapes and concetrates on the less common geometric shapes. There is a huge price range due to the wide array of shapes, sizes and complexity of jobs. For instance, a small stock triangle window that is a replacement insert might run $150 for the product and the window installation cost. A large custom pentagon picture window where window contractors are required to significantly enlarge the opening might run $900 or more. No matter what shape you choose, these are unique design elements that certainly stand out more than standard fixed windows sitting in the middle of a wall. They can be used by themselves, in conjunction with a series of similar shaped frames or in combination with a number of different shapes to produce interesting focal points and visual interest for a home. Custom jobs with large panes and combination designs will usually involve lots of cost on the install side. 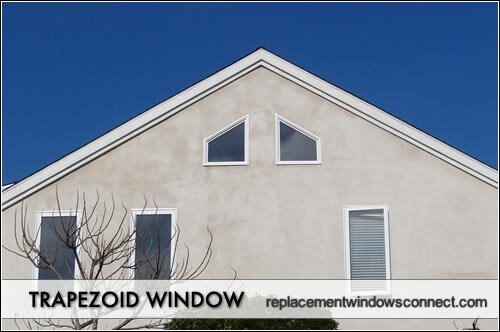 Certainly replacement inserts will be the least expensive, but many homeowners who want a series of geometric windows that makes their home stand out from the neighbors is willing to incur the higher labor costs.